Tomorrow, our lives are going to change. Tomorrow brings new Oscar winners, immortalized in the annals of history. It also brings my annual fancy-dress Oscar party, which is always a monumental event. It brings more much-needed rain to the New Mexico earth. But TODAY brings with it the launch of one of your new favorite websites, Afrobeatnik. Here are some words we will use when discussing Afrobeatnik: fashion, filmmaking, sustainability, vintage, modern, diverse, inclusive, fabulous. And it is all very, very real. BC: How did Afrobeatnik come about? AM: Pretty much by me just, combining everything I cared about… I’ve been working for the past year with a non-profit with a great mission that I really support, but I’ve been doing more administrative work, and in the past there have always been more creative things that I’ve been tied to, I’ve put more creative things into what I’m doing… so I think I’ve felt a little restricted. And one thing I’ve learned, when you restrict someone enough, pretty soon they’re just gonna burst… Afrobeatnik was this bursting of me kind of being ready to do something creative, something that I care about, and to collaborate with others as well. AM: I mean, I’ve been interested in sustainable fashion for a couple of years now. I always wanted to work in fashion, but I never thought it was going to happen because when I got to know the industry itself I wasn’t inspired (by the fashion industry). I find myself more drawn to non-profit work, so if I was going to work in fashion it would be in some independent capacity. We’re just kind of doing our own thing. We’re not really a part of any industry quite yet. I’m working with four different artisans …to upcycle vintage and to upcycle used materials and to share fashions that we think are beautiful. We’re not confined by anything, we’re not defined by anything, and it’s a really fun place to be. I’m excited to launch to see what the response is to it. BC: I’m excited, too! S and I want to buy a lot of your clothes. BC: In your own words, tell me about the mission and goals of Afrobeatnik. We’ve got a pretty varied mission, but it’s all positive, and it’s all related in some way. The mission really started with the idea of Diversity. When I moved to Seattle from the tri-cities (Eastern Washington) there were a lot more different people. Growing up, Black History Month was an extremely scary time for me, because of the feeling of isolation – being the only black kid in your class, pretty much feeling alone in every aspect according to the way that you look. When you’re growing up, trying to figure out identity and who you are, your outside appearance impacts that… When I moved to Seattle and I found a community… I really thrived as a human being. I found that working in more diverse places, with people from different backgrounds, different countries, even… the more people I interacted with who were different from me, the more of a whole person I felt like I became. I understood the world a little better. Another part of our goals in the Individuality aspect, which is tied to identity. Who you are within a community, while still remaining connected to that community. We tend to feel isolated by our differences, and what I would like to do is find ways to feel united by our differences – to love and appreciate all aspects of ourselves as individuals, and to love all aspects of others as well. I think they’re closely related – Diversity and Individuality – which is why I tied them both in. I wanted to make them both prominent values, but also separate. Lastly we have (the value of) Sustainability, which is kind of just built into the way the company works. My personal preference is always thrift shopping. I barely buy anything new. For money’s sake, for uniqueness, I feel a lot of pleasure buying used. With vintage clothing especially, there’s this charm about it, this distinguished factor. You know it’s got some interesting history. So that’s why we decided to go vintage. As for the artisans – the handmade, upcycling work that we do – sometimes vintage clothing has gone through a lot, and it needs some work, you know it needs a little facelift; to be modernized in some way. Originally I brought on one person for basic repairs, but found all these items that could be turned into something really cool… So from there I brought on more artisans who were interested in upcycling things and wanting to make something new out of something old. And I think that’s what sustainability is about. It’s about reusing things …getting full use out of something, reinventing, giving new life. It’s crazy to me that some of this stuff might’ve ended up in a trash can somewhere. Our handmade collection launch is tied to earth day in April, but we’ll have a few things on March 1st as a preview. BC: We’ve talked a lot about the fashion aspect of Afrobeatnik. One of the things that struck me the most was your ambition to use portions of your profits to make short films and documentaries that feature underrepresented cultures, women and minorities. What inspired you to tackle films as well as fashion? I got into film a couple years ago… I did a certificate program at UW, and I learned a lot, it was fun… But, unfortunately, film communities are very tight-knit, and I’m not the kind of person who can’t wait around for someone to give me an opportunity. So I decided to try and raise the money to make the films I want to make. We’re at the basic stages of it. Once we start making some profits to get equipment we need and hire a mentor to help guide us, once we get those things in place we’ll begin the final idea. We’ve been throwing ideas around of what we want to do, and we’ve settled on a narrative web series featuring traditionally underrepresented women We’d like it to be funny, diverse, and full of culture, but also relatable. We talk a lot about the TV show Girls, we have discussions about all the things we think they’re doing wrong, and all the things we think they’re doing right, and I think one of the things that’s great about it is that it’s relevant, it’s current. A lot of people relate to that show. But the show obviously lacks diversity, it lacks culture. We wanted to tackle… something like that, in a narrative fashion, but we wanted to… bring in something a little bit deeper. BC: I think that’s a really cool ambition. What are your thoughts on the importance of representative images across multiple mediums (print and screen)? That has a lot to do with why I actually started this (Afrobeatnik), kind of my whole journey of self-acceptance and coming to terms with my own beauty and individuality. Growing up, I didn’t see people on TV that looked like me, and when I did it was always with straight hair, or really really light skin. I didn’t see myself represented in media, and I think that sends a message to young girls that they’re not important or they’re not beautiful. The message is that you need to assimilate to a certain culture or a certain ideal of beauty… when that’s the only ideal of beauty that you ever know. That’s why it’s important to get these images out there. I’m sure you’ve heard a lot about Lupita (Nyong’o), she’s all over the place , and she’d not someone you’d traditionally see in Hollywood. It’s inspirational, not only for me or for an adult who’s more sure of herself, but especially for young teenagers and little girls growing up. By sending these messages through these images, we’re confirming that beauty exists in places beyond the norm, and I think that’s incredibly important. BC: Let’s go back to the fashion. Where do you find/curate the clothes for Afrobeatnik? There are a lot of different processes going on since we’re so new… We’re attending estate sales, those are awesome resources where you can find the best vintage. And also working with consigners in the area, which is a whole other part of outreach. We do have consigners who seem pretty interested in providing consistent inventory. Besides that, we also – mainly for our upcycling projects – what we’ll do is order wholesale vintage… We get a shipment and sometimes a piece looks great and we can sell it as is …sometimes the clothes need some upcycling done – repairs, like a hem, hole or buttons – other times the print/fabric is good but the design is not modern enough for everyday wear, so we turn it over to the upcyclers. We’ve only really started the upcycling program as of February, so… there’s a lot that needs to be tackled, so we’re trying to grow the artisan team. BC: Who are your models? Honestly, we’re not picky at all about our models. The whole purpose was to show real women in the clothing and to make sure the representations of women that we’re throwing out there are unique people, people who are often not seen. Most of the models are either friends of ours or people we’ve found through Craigslist. It’s interesting because people seem to be ready to hop on to a project …when they find out what we’re about. It’s great. 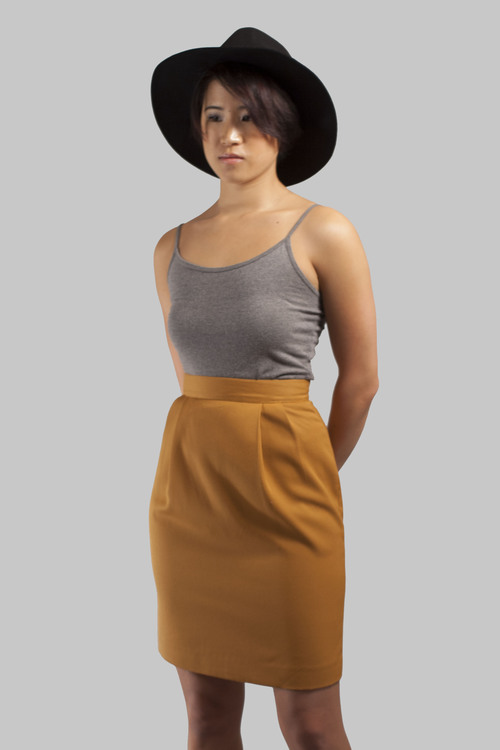 Our models are very diverse. We’ve got all kinds of races and sizes, they’re inexperienced, and they’re real. BC: I love it. I can’t speak for others who are ready to hop on this kind of project, but seeing that kind of wide representation (in fashion images) makes you want to get involved. I want to continue this effort to show a multitude of different types of women. I think that it speaks to people. It’s something we’re all experiencing on some level right now, as a movement. BC: Do you have a Photoshop policy? There’s no specific policy… but we don’t do retouching as far as body shape… skin… the other day I was retouching a photo where the model was sweating a bit, so I retouched that. But like, pimples, you can see on our launch flyer on our website (and below), the model had a little bit of a breakout, and that’s real and that’s natural and that’s the way our photos are gonna remain. See?? Didn’t I tell you that you’d fall in love? 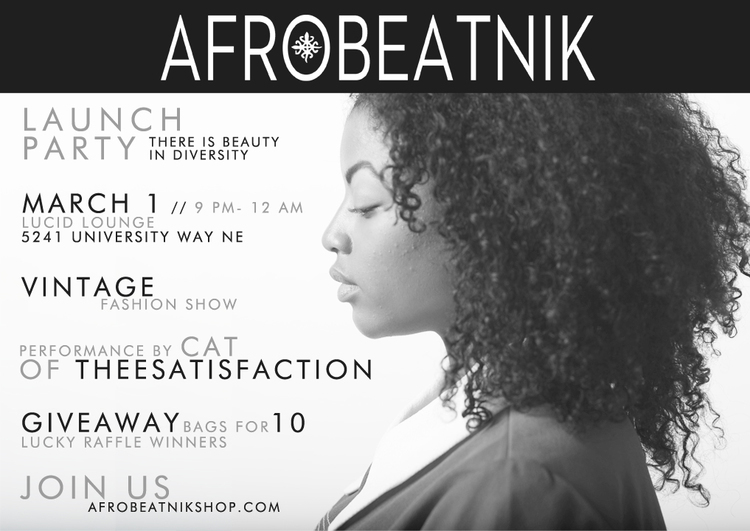 If you’re in Seattle, you lucky duck, you should totally go to the Afrobeatnik launch party tonight. I would if I were you. And all of us should definitely support the Afrobeatnik website and shop their fabulous frocks and keep our eyes peeled for their savvy, spectacular web series! Cheers to these lovely ladies and their amazing work.